Update: I apologize for the lack of updates lately. I have been busy with moving back to school so things will be a little slow around here for a few days. Sigma Giveaway: If you’ve noticed my giveaway post update, I’ve drawn a winner using random.org. Congratulations to the winner: out of focus. Please respond to my email with your full name and mailing address. I will always give the winner one week to respond to my email before drawing a different person. Don’t be upset if you didn’t win. There is another giveaway going on right now and many future giveaways. In addition, I will ask that the winner provides a short review or some sort of feedback for the readers. 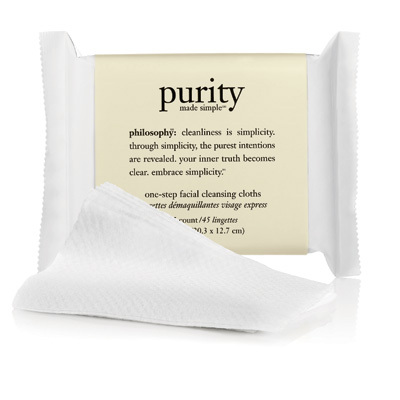 Since I like the Purity facial wash so much, I thought that I would enjoy these towelettes as well. I imagined they would take off all my makeup with a quick wipe here and there. In reality, these towelettes are small, overpriced ($20 for 45 wipes) and without the cleansing power of the original face wash. One wipe will not thoroughly clean your face. I feel like I’ve bought moist towelettes. I suggest sticking to the facial wash. I've always thought towlettes were a waste of money. But I guess that's just because of my sensitive skin that reacts to everything. Have fun back at school! Well some things work for some people, guess you are lucky! You may like the MAC Wipes.. you can back to make the packets!! Wow that is pricey for face wipes. I love the BLUM brand for face wipes. $5.00 and your good for 30+ days. i honestly hate philosophy. i tried a sample of their face moisturizer (forgot what its called) and it sucked all the moisture from my face!!! another product i bought was the primer.. that did absolutley nothing so i just returned it. sorry for the negative comment haha. They have really creative packaging, I may check out their website if they have one.. Updates, Winner, Likes and Dislikes is a beautiful topic giveaway Purity debate for Apr 2019. I read Fashion Friday: Charlotte Russe Super Secret Sale .